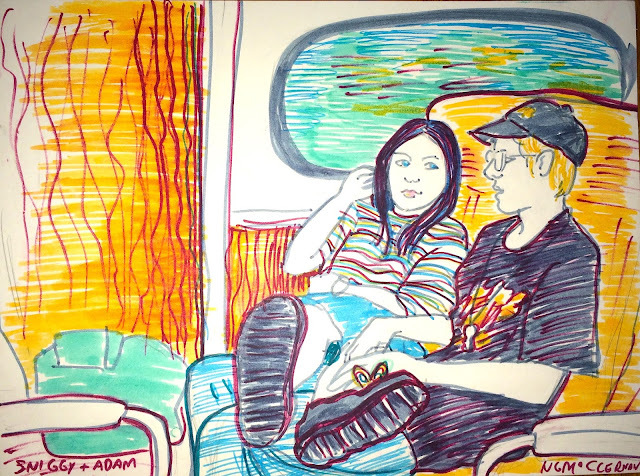 This double portrait in Crayola marker is of my daughter and her boyfriend Adam back when my daughter was into guys. They are on a train from Trenton NJ to NYC, as was my ex-boyfriend John and I, all on our way to see Spalding Gray perform his monologue It's a Slippery Slope. I had discovered Gray one day when I was home sick from work and watching the Philadelphia area public television station (WHYY) and happened to catch some of the OUR TOWN production with Gray as the Stage Manager. I didn't care for theater all that much then, outside of the plays of Shakespeare, but Gray impressed me enough that I began seeking out his other work, which was available on videotape. Somehow I compelled both my daughter and my boyfriend to come along with me to New York City - this was unique in our semi-family unit because John almost never traveled anywhere. In fact, for as long as I knew him, the only times, save one, in which he did venture outside of the Philadelphia metro area was at my behest - once to Baltimore to see the aquarium, three times to the Jersey Shore and twice to New York City. The one time he did venture out of the Philly area without me was to his friend Seth's wedding, in Washington DC, I think, but we were just about broken up by then. In fact, although this trip to see Spalding Gray happened in 1994, John and I were on our own slippery slope to parting ways, which we didn't actually do until 1997. But it was all downhill after I met this guy. There is an interesting documentary available for free on Youtube (in multiple parts) called Spalding Gray A Life in Progress. Here is part 1.